WTF President Chungwon Choue (right) and ITF President Ung Chang (left) shake hands after they signed the memorandum in a ceremony held in Nanjing, China on Aug. 21, 2014. The World Taekwondo Federation (WTF) and International Taekwondo Federation (ITF) have signed a memorandum which will open up dialogue and increase collaboration between the two organizations for the benefit of the entire global sport. 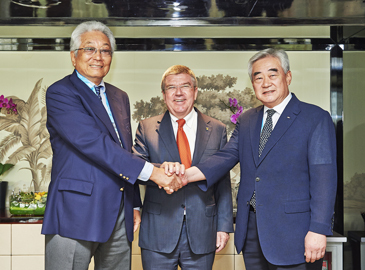 WTF President Chungwon Choue and ITF President Ung Chang signed the memorandum on Aug. 21, 2014 in a ceremony in Nanjing, China during the Youth Olympic Games. As part of the agreement, athletes currently registered to the WTF and ITF will be free to compete in one and the other’s competitions under the rules of each organization, creating new exciting opportunities and ensuring that the world’s very best taekwondo athletes can compete in the world’s very best taekwondo tournaments. 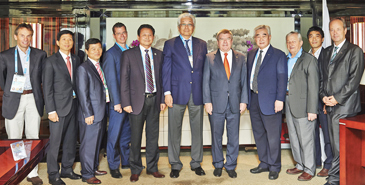 ITF President Ung Chang (center) poses with WTF President Chungwon Choue. At second from left is Dr. Kang Seok-Jae of WTF's deputy secretary general. “This is a historic step for taekwondo – it is a kind of family reunion. With common roots and a common history, the two federations belong to the same family and it is great to see such an accord. "It is in the best interests of the young athletes and lays a firm foundation for cooperation for the future." "We are delighted to have signed this agreement with the ITF. We are always looking at ways to develop and evolve taekwondo for the benefit of athletes and fans and opening up our relationship with the ITF is a key way of doing this." “It is appropriate that this agreement has been signed here in Nanjing as the emphasis of the Youth Olympic Games is not just on sporting competition, but also on education and cultural understanding and that is part of what we are trying to achieve through this agreement." "With this agreement, the WTF will do its upmost to ensure that every taekwondo athlete has the opportunity to compete at the Olympic Games." "It is great that the two organizations finally reached an agreement for cooperation after many years of discussions and efforts. "This is only the beginning of our cooperation and there will be more to achieve together."